Beyblade Arena Cake | Tiffany Loves Cake! I got a call from someone my mother referred to my site. She was wondering if I could make her grandson a cake. She asked if I could make a Beyblade Arena cake. I had literally no idea what that meant or what she was talking about, but I promised to google it and call her. 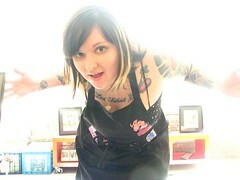 I didn’t know what Yo-Gabba-Gabba was either, but we know I was able to make some cool Yo Gabba cakes! Someone likened it to Crossfire from when I was a kid. I don’t remember if my brother had a Crossfire, but I do totally remember the commercials. Now, I don’t really think this thing is as awesome looking as Crossfire, but a. )What do I know? and b. )Unless they have an AWESOME commercial like that, I don’t think anything could look as cool as Crossfire. In any case, all that aside, I decided I would gladly make the cake. I knew I couldn’t make the arena super deep like that because they wouldn’t have any cake to eat! So I made it pretty shallow. I covered the cake with white fondant and then airbrushed the red on. Let me just say HOLY CRAP. That made my life so much easier. Making red fondant is SUCH a hassle and it always wants to turn pink. It takes up a ton of color and then ends up practically inedible and gives it a crap texture. No thank you. Because of that, I’ve been weary of making cakes with large amounts of red, but never again!! It’s SO RED. So happy about that. I made a couple little disc things. No idea what their technical term is. I mean… they’re not cars. They’re like… disc things. So yeah. I didn’t stick them onto the cake so the kid could pick them up and move them around and stuff lol. Yup. 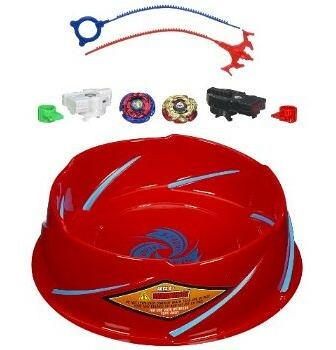 So.. that’s Beyblade. Lot’s of red, not quite crossfire, possibly something to do with anime??? Just not sure haha. But I sure made it out of cake. I’m getting started on a killer wedding cake tonight. I can’t wait to show you guys. This will be the second wedding cake I’ve ever made and it’s for two special people who I adore. So I have to make this cake super adorable just like they are! The colors are white, purple and black. It’s going to be very unique and I can’t wait! I still can’t believe you didn’t know what Yo Gabba Gabba was and you probably listened to the people’s bands that created the show… Mark Mothersbaugh of DEVO and the singer of Aquabats. I LOVE Yo Gabba Gabba. When Colton was a newborn, he would be mesmerized by DJ Lance Rock. That is the only kids show that I’ve ever found that has good music – and I mean music that I would listen to. The cake is awesome! I watched this show on the food network the other day where this cupcake shop used berries instead of dye for color. It was pretty rad and they said it tasted awesome. That was for buttercream though, don’t know if you could do the same for fondant. Sounds delicious. Doubt it would work for the fondant. Fondant is all about consistency and texture and stuff. This is fantastic! My son asked for the exact same thing and i didn’t really know where to start! So glad this was helpful to you. 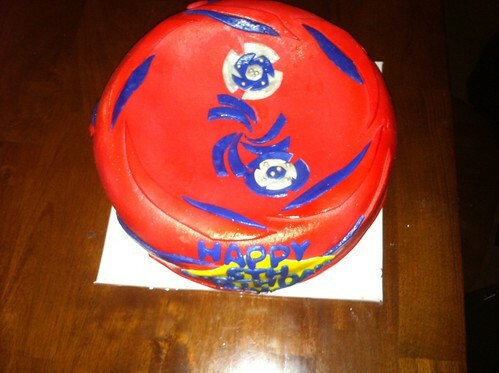 The amount of google hits I get from people searching for Beyblade cake ideas is INSANE. I had no idea it was so popular. This is just what I was looking for-making the same thing for my nephew this weekend-how big was your cake and did you just use round cake pans and then cut out the arena? I used 12″ springform pans and did two layers. If you use box mix, I’d put a full box mix for each layer. I let the cakes cool, then popped them out, wrapped them in plastic and let them sit in the freezer for about an hour. That way when I carved, they didn’t fall apart. I leveled the bottom layer, iced between the layers, stacked them and then I used a paring knife and a bread knife to carefully cut out the inner dome. I put it back in the freezer for a moment so it wouldn’t crumble when I iced it. I iced with with a frosting spatula with some thinned buttercream and them covered in fondant. 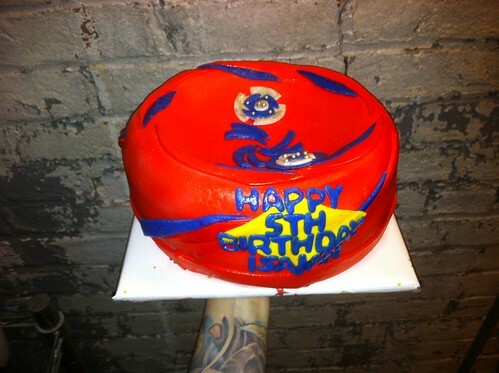 It’s funny, I had no idea what Beyblade was until I made this cake and this post is my most viewed post. I think I need to do a tutorial on this cake. You should definitely due a tutorial! My son wants this cake for his birthday…I’m just hoping I can pull it off! But they should never known what version of shoes pick from. Other models soon have been written and published that had must not style as atmosphere Max 1.
writing posted at this web site is truly fastidious. Hey there! This post couldn’t be written any better! Reading this post reminds me of my good old room mate! He always kept talking about this. I will forward this write-up to him. Fairly certain he will have a good read. Thanks for sharing!